"The work of art must be entirely conceived and formed by the mind before its execution. It must receive nothing from nature's given forms, or from sensuality, or sentimentality." "'Concrete Art' is in full development, above all in the free countries, and the number of young artists participating in the 'movement' increases in these countries. The future!" "Human thinking in general (and mathematical thinking in particular) need, in the face of the unlimited, a visual support. This is where art comes in." "Concrete art holds an infinite number of possibilities." "Such constructions are developed only on the basis of their given conditions and without any arbitrary attempt to modify them for reasons of proportion. With this method once the basic theme has been chosen - whether it be simple or complex - an infinite number of very different developments can be evolved according to individual inclination and temperament." "This method of thus developing and transforming a fundamental idea - a theme - into a variety of expressive forms derived from the theme itself is used by various artists in the realm of concrete art." "Every time I was working on something I used to wonder when I finished what were going to be the effects in other areas of thinking: .... General culture, sociology, philosophy, and politics too." "Madí rises up, validating man's steady, absorbing desire to invent and construct objects with the absolute values of the eternal; together with humanity in its struggle to construct a new classless society that liberates the energy and dominates in every sense space, time and matter." "We use the term 'neo-concrete' to differentiate ourselves from those committed to non-figurative 'geometric' art (neoplasticism, constructivism, suprematism, the school of Ulm) and particularly the kind of concrete art that is influenced by a dangerously acute rationalism." "We do not conceive of art either as a 'machine' or as an 'object' but as a quasi-corpus, that is, an entity whose reality is not exhausted in the external relationships of its elements; an entity that, though analytically divisible into its parts, only gives itself up fully to a direct, phenomenological approach." 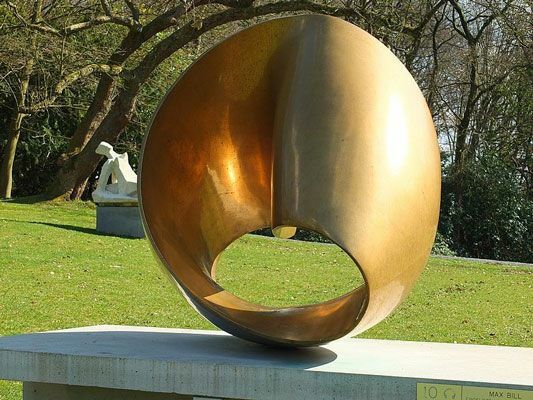 Amongst the many artists central to this yoking together of revolutionary and artistic sentiment were the sculptor Naum Gabo, his brother Antoine Pevsner, Varvara Stepanova and her husband Alexander Rodchenko, and Vladimir Tatlin. As significant as the revolutionary impetus of their work - and closely related to it - was a current of logical, scientific, anti-emotional thought. To these artists, non-figurative expression became a way of representing the objective scientific and mathematical forces that configured the universe's appearance to the naked eye. By representing those forces, their artworks would become the talismans around which Soviet society and psychology would construct itself. In their 1920 statement "The Realistic Manifesto", Gabo and Pevsner asserted: "we construct our work as the universe constructs its own, as the engineer constructs his bridges, as the mathematician his formula of the orbits". This basic sentiment remained at the core of much Concrete Art. While Constructivism was being defined and debated in Russia, a group of artists based in the Netherlands were developing a geometrical abstraction of similar import, though with a more spiritual, less explicitly politicized value. Chief amongst them was the Dutch painter Piet Mondrian, who, during the 1900s-10s, was influenced first by Seurat's Pointillism and then by Picasso and Braques's Analytical Cubism. Attracted to artistic styles that proposed universally applicable principles of composition - and committed to the logical dissection of the picture plane - he fell increasingly under the sway of the Theosophical movement. In particular, he was inspired by the Neo-Platonist mathematician M.H.J. Schoenmaker, who in his 1916 text Principles of Plastic Mathematics had proposed a system of mathematical forms underlying all perceptible reality, consisting of contrasting horizontals and verticals and the three primary colors. The following year Mondrian, along with the Dutch artists Theo van Doesburg, Vilmos Huszár and Bart van der Leck, and the architects J.J. Oud, Gerrit Rietveld and Robert van 't Hoff, founded the journal De Stijl. It was dedicated to the newfound principles of abstraction that Mondrian had discovered in theosophical theory and mathematics, and which other group members had reached independently. Pioneered by Mondrian and dubbed "Neo-Plasticism", the style promoted in the journal was based on a strict, non-symmetrical arrangement of vertical and horizontal elements, with the color-palette restricted to black, white, red, yellow and blue. The aim, in short, was to forge a universal language for art that could unite peoples and cultures in the wake of the First World War. Like Constructivism in Russia, this new style was intended to transcend medium boundaries, with comparable principles being applied to design and architecture. If Constructivism supplied the political and rational vigor of the Concrete Art movement, Neo-Plasticism provided an underlying spiritual impetus, while still being rooted in a utopian social vision, and in comparable principles of rational, geometrical abstraction. In practical terms, debates in and around the De Stijl grouping gave rise to the coinage of the term Concrete Art, as its most outspoken member Theo van Doesburg became increasingly frustrated with the strict formalism of Mondrian, and hunted out new forms and terminologies. Amongst the sources of friction in the Neo-Plasticist movement during the early 1920s was that Theo van Doesburg was increasingly engaged with the ideology of the Bauhaus school. Formed in Weimar in 1919 by the architect Walter Gropius, the Bauhaus had by the early 1920s become the principle outpost of Constructivist aesthetics in Europe, particularly after László Moholy-Nagy took over the school's "basic course" in 1923. Van Doesburg gave lectures on De Stijl at the Bauhaus in 1921, and in 1922 moved to Weimar to integrate himself with the faculty. He was considered too dogmatic by Gropius to be offered a teaching post, but based himself near the institution, teaching interested students about Constructivism, Dada and De Stijl. During 1912-14, Mondrian had lived in Paris, and in 1919 he returned there. In 1923 van Doesburg left Weimar for the French capital to be closer to him, but their physical proximity - previously, they had never actually lived near to one another - led to animosity. Introverted and esoteric, Mondrian was often affronted by the pugnacious, extroverted van Doesburg. 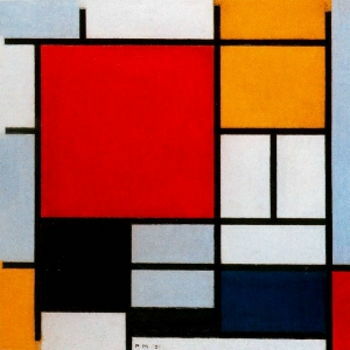 Van Doesburg was also becoming increasingly frustrated with Neo-Plasticism's insistence on the exclusive use of primary colors and straight lines. In 1926, he developed a style called Elementarism which introduced diagonals and mixed colors into the compositional lexicon: his Simultaneous Counter-Composition (1929-30) gives a sense of the distinctions which had emerged within the movement around De Stijl by that time. Mondrian, for his part, seceded from the group in protest. Nonetheless, Mondrian and van Doesburg remained in Paris for the remainder of the 1920s, and it was partly their presence there which meant that the most vital developments in geometrical abstraction during that decade occurred within the city, culminating in the publication of Van Doesburg's "Basis of Concrete Painting" in 1930, just a year before his death. As well as hosting a burgeoning abstract art movement, Paris in the 1920s was the center of Surrealism, spearheaded by the writer André Breton, which had emerged partly from the anti-rationalist spirit of Dada. Combining Dada's love of the inexplicable and other-worldly with an increasingly realistic method of representation, Surrealism stood for all that artists such as Mondrian and van Doesburg opposed. It was partly from this sense of collective opposition that various new groupings emerged in the late 1920s, committed to the cause of a rational, abstract art. 2. The work of art must be entirely conceived and formed by the mind before its execution. It must receive nothing from nature's given forms, or from sensuality, or sentimentality. We wish to exclude lyricism, dramaticism, symbolism, etc. 3. The picture must be entirely constructed from purely plastic elements, that is, planes and colors. A pictorial element has no other meaning than "itself", and thus the picture has no other meaning than "itself". 4. The construction of the picture, as well as its elements, must be simple and visually controllable. 5. Technique must be mechanical, that is, exact, anti-impressionistic. 6. Effort for absolute clarity. 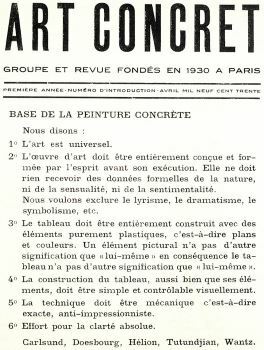 "Basis of Concrete Painting" (1930) is a typically terse, polemical tract, calling in effect for a synthesis of all previous movements towards the rational expression of non-naturalistic subject-matter. Espousing a universal compositional language freed from emotional, spiritual, and subjective impulses, van Doesburg laid the groundwork for a movement that would divorce itself entirely from the expression of perceptual reality or symbolic meaning. Concrete Art was to be a language of pure form, signifying nothing more itself, defined on universally intuitable and logical principles. At the root of this ideal were both the rational and political idealism of Russian Constructivism and the esotericism of De Stijl. In 1931, Van Doesburg died of a heart attack, aged just 47. His manifesto thus stands as an unrealized statement of intent, and it was down to a younger generation of artists to bring his vision of Concrete Art to fruition. 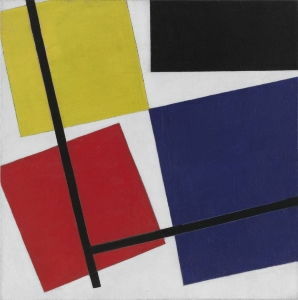 One of van Doesburg's last acts was to help found the group Abstraction-Création, which incorporated Cercle et Carré and Art Concret, uniting the sparring factions in Paris's community of abstract artists. Following Theo van Doesburg's death, a figurehead was needed to spearhead the nascent Concrete Art movement. Although both Wassily Kandinsky and Hans (Jean) Arp penned their own manifestos for concrete art (in 1938 and 1942 respectively) it was necessary for this figure to emerge from the younger generation of abstract artists. Such a figure emerged in Switzerland in the form of the artist and polymath Max Bill. Born in 1908, Bill had studied at the Bauhaus during 1927-29, learning from artists including Wassily Kandinsky, Paul Klee, and, most significantly, Josef Albers. In 1929, Bill moved to Zurich to set up a studio, focusing on sculpture, painting and architecture while he earned money as a designer. Influenced by his Bauhaus tutors, Bill sought through his work to express scientific and mathematical formulas in intuitive and tangible forms, expressing as little as possible of his own emotional investment in his work, and eschewing 'subject-matter'. In this sense, his work was quintessentially Concrete. Nonetheless, Bill was twenty-five years younger than van Doesburg, and had no strong personal connection to him. His seizure on the term "Concrete Art" represented an act of homage, even appropriation. Still, it was primarily through Bill's endeavors over the next two decades that Concrete Art found widespread recognition and acceptance. 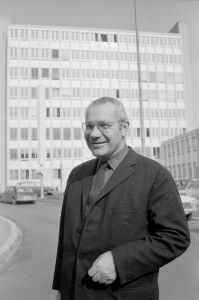 In 1937, Bill formed the Allianz group to promote Concrete Art, along with the artists Richard Paul Lohse and Leo Leuppi. The group held its first show in Basel that year, and subsequent exhibitions were mounted across Switzerland during the late 1930s and early 1940s. Switzerland's neutrality during the Second World War ensured the group's continued productivity while artists and writers fled from violence and persecution in nearby countries. Some of the group's work - like Bill's Endless Ribbon series of Möbius strip sculptures - aimed to express the new scientific theories which defined modernity, such as space-time relativity. Others, like Lohse, used methodical visual arrangements to draw out all the possible visual expressions of a mathematical or algebraic formula. In all cases, the compositional aesthetic was meticulously neat, and the work entirely divorced from 'reality' as such. At the same time, the Allianz artists were interested in exploring tonal harmonies, and their work is often vibrantly colorful as compared to that of the De Stijl artists, for example. In the context of the Second World War, Concrete Art also had an implicit political impetus: in attempting to define a universally intuitable visual language, Concrete Artists were attempting to lay the groundwork for intercultural dialogue and empathy. 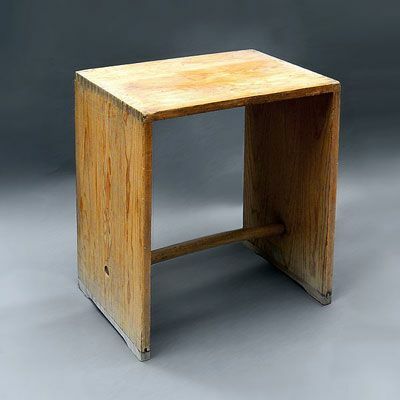 From the 1940s onwards, Bill increasingly turned his attention to commercial and industrial design, following in the footsteps of the Constructivists, who had sought to merge artistic expression with functional craftsmanship. In 1944 Bill cemented his own reputation and that of Concrete Art by staging the first international exhibition of Concrete Art in Basel, by which time the style was spreading across Europe and beyond. By the mid-1940s, groups influenced by Bill and the Allianz group's variant of Concrete Art had sprung up all over the world. These groups emerged organically, from a range of regional and national contexts, and expressed a huge range of creative impulses. But they were all buoyed by the internationalism of the post-war years, and united by an underlying interest in non-figurative expression, as well as an investment in science, maths and logic. Limiting our focus to Europe, we can posit at least eight groups to emerge between the end of the Second World War and 1960. The earliest of these included Linien 2, founded in 1947 in Copenhagen, Movimento Arto Concreto, founded in Milan in 1948, Group Exat 51, founded in Zagreb in 1951, and Group Espace, founded in Paris in the same year. Amongst the significant artists of the post-war period to attach their names to these groups were the Danish Ib Geertsen, the Italian Alberto Magnelli (a former member of Abstraction-Création), and the sometime Orphist Sonia Delaunay. Paris remained a center of activity, with the first significant exhibition of Concrete Art following the Second World War held at the Gallerie René Drouin in 1945. This exhibition included the work of pioneers of Neo-Plasticism and other proto-Concrete movements, such as César Domela and Jean Gorin, exemplifying the tendency of Concrete Artists and theorists to claim developments prior to 1930 as steps in the advancement of the genre. 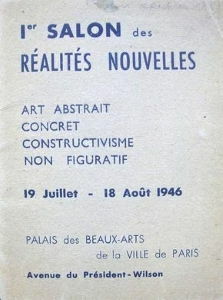 In 1946, the Salon des Réalités Nouvelles was founded as a successor institution to the Abstraction-Création group: the new, Paris-based gallery promoted what it called "concrete art, non-figurative or abstract art". In a sense, the Concrete Art movement in post-war Europe occupied a liminal space between a range of more famous contemporary genres, such as Kinetic and Op Art, and the last vestiges of pre-war geometrical abstraction. As such, it never developed the coherent character that it would elsewhere: specifically in the resurgent post-war cultures of Latin America. 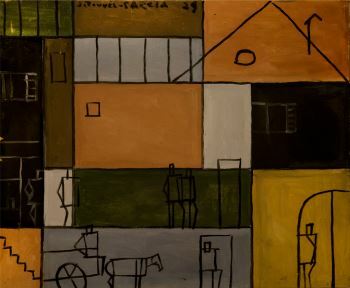 Joaquin Torres Garcia's Pintura Constructiva 6 (1929). 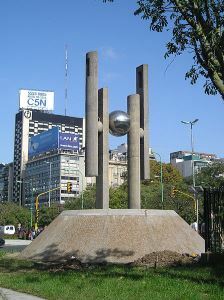 Garcia returned to his native Uruguay in the 1930s and helped to spearhead the early development of concrete art in Latin America. We might posit various reasons why the most significant developments in Concrete Art between the end of the Second World War and the start of the 1960s occurred in Latin America. One may be the newfound confidence that the major economies of Latin America, including Brazil and Argentina, had assumed in the aftermath of the war in Europe, shielded from its long-term effects while benefiting from the wartime economy. These countries had also welcomed an influx of European artists and theorists fleeing the conflict, while the appropriation of Realist and folk-art by authoritarian governments in Mexico and elsewhere led to a flight from an art of 'easy messages'. Since the 1930s, artists like Joaquín Torres-García (co-founder of Cercle et Carré) in Uruguay and Emilio Pettoruti in Argentina, had also been pioneering a regional traditional of geometrical abstraction. An important early event in the emergence of Latin-American Concrete Art was the publication of the single-issue art journal Arturo in Buenos Aires in 1944, leading to formation of the Asociación Arte Concreto-Invencíon in the city the following year, and the Arte Madí group in 1946. Both groups were heavily influenced by De Stijl and European Concrete aesthetics, and both were committed to an art of pure geometrical abstraction. However, in Latin America Concrete Art also inherited something of the political vigor of the Russian Constructivist vanguard, its products often intended to stand for new forms of social and political organization. The continent was, after all, undergoing a period of rapid industrial, technological and social development; as such, Concrete Art became an ambitious, future-oriented genre. The Asociación Arte Concreto-Invencíon was co-founded by Tomás Maldonado, a committed Marxist who believed that the logical forms of Concrete Art could form the basis for new models of societal organization and new psychological paradigms. As such, the Asociación artists - including Maldonado, Manuel Espinosa, Alfredo Hlito, Enio Iommi, Raúl Lozza and Lidy Prati - remained committed to a number of tight creative constraints. The Arte Madí artists - Gyula Kosice, Rhod Rothfuss and Carmelo Arden Quin - were also committed to the expression of modern life through Concrete Art. But their forms were more playful than those of the Asociación artists, moving more freely into the realms of sculpture, Kinetic and Light Art, and influencing the later emergence of Neo-Concretism in Brazil. Following the emergence of the Arte Madí and Arte Concreto-Invencíon groups, similar collectives sprang up elsewhere, such as the Grupo de Arte No Figurativo in Montevideo, Uruguay, the Grupo Frente in Rio de Janeiro, and Grupo Ruptura in São Paulo. All three were formed in 1952, a year after a major retrospective of Max Bill's work in São Paulo had cemented his reputation amongst Latin-American Concretists. The latter two groups proved particularly influential on subsequent developments in Concrete Art. Grupo Frente included the artists Lygia Clark, Hélio Oiticica and Lygia Pape, all of whom were involved in the conceptualization of Neo-Concretism at the close of the decade. The Grupo Ruptura, meanwhile, laid the foundations for the emergence of Concrete Poetry - a kind of visual poetry influenced by Concrete Art - through their creative exchanges with the poets of São Paulo's Noigandres collective. The construction of Brazil's new capital Brasília, during 1956-60, on principles strongly influenced by International Style architecture, Constructivism, and the country's emergent Concrete Art movement, shows the significance of the movement in Latin America. It was here, and not in Europe, that the principles of Concrete Art were most strikingly advanced at mid-century. The most significant late development in Concrete Art in Europe was probably the formation of the Hochschule für Gestaltung in Ulm, West Germany in 1953. Co-founded by Max Bill and Inge Scholl, sister of the murdered White Rose Movement leaders Hans and Sophie Scholl, the HfG was established as a successor institute to the Bauhaus, which had closed under Nazi pressure in 1933. As such, it was committed both to the cultural and moral rebirth of Germany and to advancing the principles of abstract art, functional design, and architecture. Again, the aesthetics of Concrete Art were integrated with a progressive political agenda. 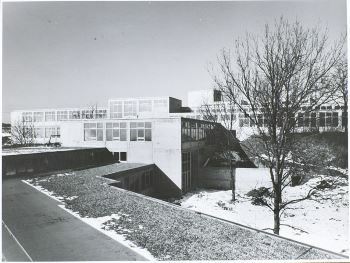 Though the school had closed by 1968, many artists connected to the Concrete Art movement, including Tomás Maldonado and Josef Albers, were involved in designing or teaching courses at Ulm, and so the influence of Concrete Art was impressed upon a further generation of designers, architects, and artists. As such, and because of the HfG's interdisciplinary approach, the principles of Concrete Art remained in fruitful dialogue with functional design and architecture even at this late stage of its evolution. Nowhere is this more evident than in the design of the HfG campus itself by Max Bill, on principles strongly influenced by his aesthetic as an artist, and by International Style architecture. The poet Eugen Gomringer also worked at the school, as a secretary to Bill (who was the Hochschule's first rector). In 1955, Gomringer hosted the Brazilian poet Décio Pignatari, a representative of the São Paulo based Noigandres group. This resulted in the development of Concrete Poetry, which took on its own tenor and character as it merged with developments in late Anglo-American literary modernism, serving as one of the Concrete Art movement's lasting legacies. With the inauguration of the São Paulo Biennial in 1951 and the mounting of a National Exhibition of Concrete Art in São Paulo in 1956, Brazil had established itself as one of the centers of the modern art-world, and of the Concrete Art movement in particular. However, by the close of the 1950s, many Brazilian artists felt that Concrete Art had become inordinately narrow and inadvertently colonialist in its outlook, binding itself to strict rules of composition that were overly invested in rationalism, and tethered to the pre-war achievements of European artists. A number of artists involved in the Grupo Frente, including Lygia Clark, Lygia Pape, and Hélio Oiticica began producing artworks more governed by intuitive, phenomenological interactions with materials and space, inviting more creative interactions with the viewer. We use the term "neo-concrete" to differentiate ourselves from those committed to non-figurative "geometric" art (neoplasticism, constructivism, suprematism, the school of Ulm) and particularly the kind of concrete art that is influenced by a dangerously acute rationalism. The Neo-Concrete movement was short-lived, as by the 1960s its founding members were moving into event-based and conceptual practices, but its influence has, ironically, been far more widely felt than the movement it supplanted. In placing the affective, sensory relationship between viewer and artwork at the center of its concerns, it predicted and helped to bring about a more general sea-change in modern art from the 1960s onwards; it was particularly analogous to the contemporaneous development of Minimalism in North America. By the 1950s, artists such as Victor Vasarely in France and Alexander Calder in the USA (and, slightly later, Bridget Riley in England) had applied their fascination with logical constructive principles and non-figurative form to artworks which gave the impression of motion, or which literally moved. In extending the artwork in time as well as space, they applied concrete principles of construction to a new dimension of expression, breaking down the established boundaries of geometrical abstraction. Other artists, such as the French-Hungarian Nicholas Schöffer, produced Kinetic works powered by computers that would move in response to external stimuli - such as his CYSP 1 (1956) - heralding the emergence of Systems Art and Cybernetic Art. Concrete and Constructivist principles were extended into the realm of semi-autonomous machines, presented as artworks, or even as artists (CYSP 1 famously performed in a ballet). In the face of such developments, Concrete Art seemed increasingly staid in its ambitions. Nonetheless its advances prefigured and inspired those of Kinetic Art, which also drew in Concrete Artists such as Gyula Kosice. 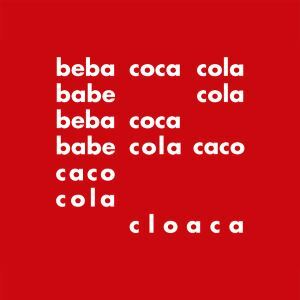 Décio Pignatari's concrete poem “Bebe Coca Cola” (1957) offers an ironic commentary on North-American consumerism. The word “cola” mutates into the word “cloaca”, associated with waste and excrement. Like Constructivism, Concrete Art was intended to define compositional principles so elementary that they would transcend medium boundaries. One aspect of this vision was realised in the mid-1950s through the emergence of Concrete Poetry. Through the collective endeavors of the Swiss poet Eugen Gomringer - based at the Hochschule für Gestaltung in Ulm - and the Brazilian poets of the Noigandres collectives (consisting of the brothers Augusto and Haroldo de Campos and Décio Pignatari), a style of poetry was defined that spread across continents, and which responded to the compositional advances of Concrete Art. The first manifesto of Concrete Poetry was written by Gomringer in 1954, though its tenets were firmly established by the Noigandres's "Pilot Plan for Concrete Poetry" in 1958. The aim of Concrete Poetry was that words would be used in the same ways as the compositional elements of a Concrete Artwork, referring to nothing more than the compositional logic of the poem itself, and often presented in visual patterns borrowed from Concrete Art. Though this proved an almost impossible aim to realise in the long term, Concrete Poetry nonetheless inspired an international movement, with more clusters of Concrete Poets appearing across the world during the 1950s-60s - and in more locations - than had cells of Concrete Artists during the 1940s-50s. Between 1968 and 1970, three major anthologies of Concrete Poetry appeared, signalling both the high-water mark and beginning of the end of the Concrete Poetry movement. Like the Concrete Art movement, its achievements had by this point been redefined by artists frustrated with the inherent limits of its rationalist programme. In 1950s America, a number of artists and sculptors turned against the romantic angst and mythologization of the individual that characterized its most successful post-war export, Abstract Expressionism. Many of these artists looked back to the examples of De Stijl and Constructivism for an artistic style based on more rational, impersonal principles. Since the 1930s, the USA had also welcomed a number of émigrés from Europe schooled in the principles of geometrical abstraction, such as Josef Albers, who left Germany following the closure of the Bauhaus under Nazi pressure in 1933. Though Concrete Art was never as coherent and dynamic a movement in North America as in South America, individual artists such as Charles Biederman made distinctive contributions to the development of geometric abstraction in the 1940s-50s. Josef Albers's tenure as head of the painting programme at Black Mountain College from 1933 to 1949 also ensured that principles of logical, non-figurative composition influenced the development of North-American painting at mid-century. Moreover, in a number of native North-American movements, particularly Hard-Edged Painting, we can sense a fascination with the internal dynamics of composition, an emphasis on clarity of form, and a rejection of the artist's individual emotional imprint, bearing the mark of Concrete Art's influence. 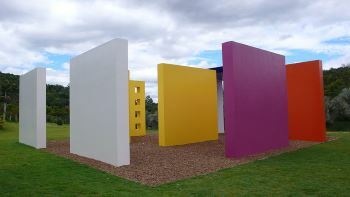 Through this development and many others, including the emergence of North-American Minimalism in the early 1960s, the influence of Concrete Art resonates through the subsequent development of post-modern art. 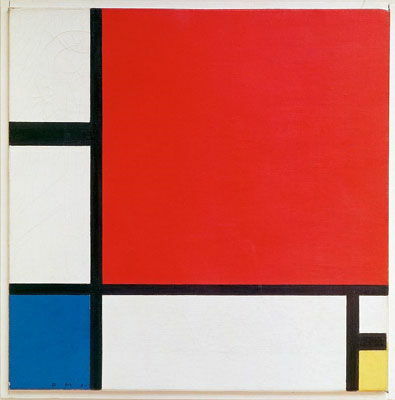 Though this painting was not conceived as a work of Concrete Art, Mondrian's vision of a universal compositional language rooted in a minimum of elements - horizontal and vertical black lines framing squares of white, red, yellow, and blue - summed up the spirit of Concretism avant-la-lettre. Moreover, the earliest works of Concrete Art were imbued with the spirit of Neo-Plasticism, and took their impetus from a manifesto penned by Mondrian's sometime compatriot Theo van Doesburg in 1930. In 1960, Max Bill mounted the exhibition Konkrete Kunst in Zurich in order to celebrate 50 years of Concrete Art's development, suggesting that the movement's primary polemicist was happy to incorporate early twentieth-century artists into its heritage.